You are here: Home / Galaxy Note 4 How-To Guides / How to use Galaxy Note 4 side key panel? What is Galaxy Note 4 side key panel? Galaxy Note 4 is a large phone. If you still want to operate it with one hand, you may find it is a bit difficult. 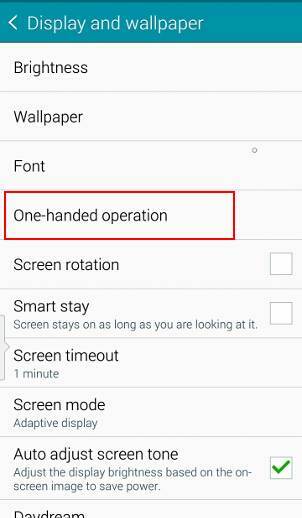 So, Samsung developed a few features that make one-handed operations easier in Galaxy Note 4, for example, one-handed input, and reduce screen size. In Galaxy Note 4, a new feature named side key panel was introduced. Galaxy Note 4 side key panel gives you navigation buttons on screen so that you can access to them without considering orientation and location. You are not limited to hardware buttons (Home, Recent, and Back). You can select up to 4 keys to the key side panel. Currently, you can select these items from Home, Recent, Back, Apps, Menu (more options), Reduce screen size. Anyway, 2 of them cannot be added to the panel. This feature is actually very useful, not just for one-handed operation. For example, if you miss the hardware menu button, you can add it to side key panel, instead of tapping and holing recent button as shown in this guide. This feature is similar, but not identical to the toolbox in Galaxy S5, as the later is for quick access to apps. 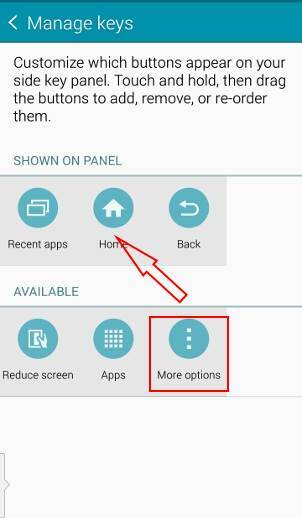 How to enable Galaxy Note 4 side key panel? 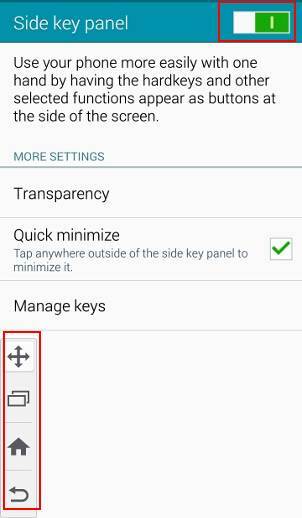 To enable Galaxy Note 4 side key panel, please follow these steps. 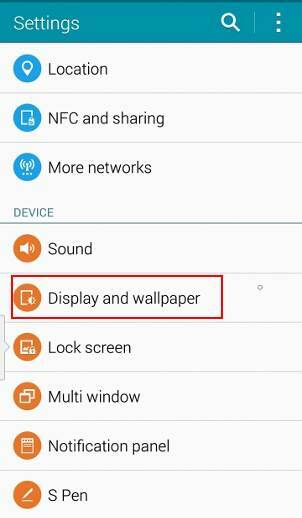 Step 1: Go to Settings, tap Display and wallpaper as shown below. Step 2: Tap One-handed operation. Step 3: Tap Side key panel. Step 4: Drag the switch to right to enable, left to disable as shown below. Of course, you can also enable/disable it from quick settings panel. Now you can see the side key panel as shown below. How to configure Galaxy Note 4 side key panel? 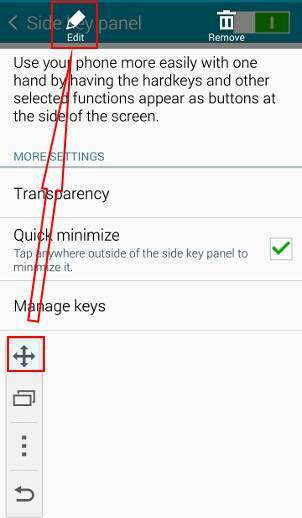 By default, the 3 keys in Galaxy Note 4 side key panel are Home, Recent and Back as shown above. They are identical to hardware buttons on Galaxy Note 4. However, you can configure the side key panel with other keys (up to 4). For example you may want to replace the Home key with Menu key. 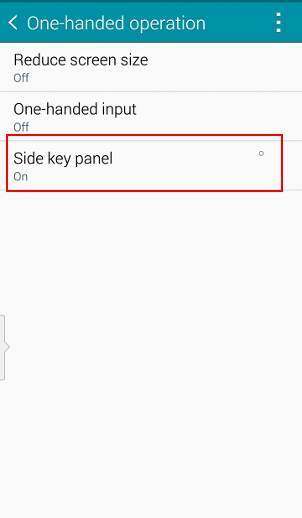 To configure Galaxy Note 4 side key panel, you can choose one of the two following methods. Method 1: Tap and hold the handler key (the first one) in side key panel, then drop it to Edit in the top of the screen, as shown below.. Method 2: Go to Settings—Display and wallpaper— One-handed operation — Side key panel —manage keys. 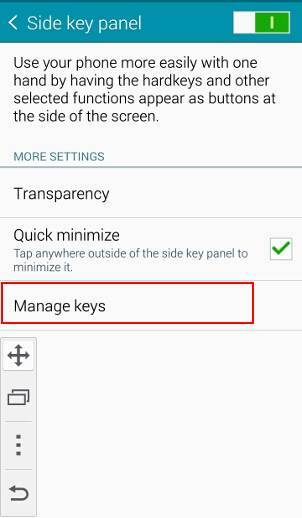 Both methods will direct you to the identical page for you to configure keys in Galaxy Note 4 side key panel. In the manage keys page, tap and hold the more options(menu) button, and drop it over Home button as shown below. This will replace the Home key. If you drop it into the empty box in the end of the row, it will be added to the side key panel and there will be 4 keys in the side key panel. Now, in the side panel, you will find the menu key is available. Galaxy Note 4 side key panel is very easy to use. But before you try it, it is recommended to turn on Quick minimize. This allows you to minimize it when you tap anywhere outside of the side key panel. In any screens (home, app drawer, or individual apps), tap and drag the handler to get the side key panel. Touch the desired keys to get what you want. Can you use Galaxy Note 4 side key panel ? If you have any problems or questions to use or configure Galaxy Note 4 side key panel, please post them in the comment box below. 1- This device allows my Samsung Note 4 to project the screen to my Samsung smart tv, CORRECT? I also have an older Samsung 3D LED tv, would it work for this tv also? 2- Do I even NEED this adapter? 3- Non-related to my 2 previous questions …. I noticed many grammatical/spelling “errors” in your articles. If you need a proof reader, please don’t hesitate to ask. I am not a “professional”, just a retired teacher who enjoys learning and reads constantly. When I am reading, “errors” seem to light up like a blinking … “look at me ” sign. Consider this a FYI! Thank you for taking the time to read and answer my questions. And thank you for all the great articles of insight to my many electronic devices!! Personally, I would NOT recommend MHL adapter. Most manufactures do not support it at all. Samsung also stopped supporting it from Galaxy S6. My recommendation is the $35 Chromecast. It works with any TVs with HDMI ports (most TVs released in last 10 years should have at least one). Actually, TV is just a output device for Chromecast. 1. Most Samsung’s smart TVs can connect to Samsung phones through WiFi connection (WiFi Direct/Miracast) without any adapters. But this depends on TV and phone model. For the old TV, you need an adapter. Again, my recommendation is Chromecast. 2. I suggest you get a $35 Chromecast. You can cast to the TV from most Android devices, iOS devices and PC/laptops. 3. Thank you for the feedback and offering help. We will check the pages more carefully for any new posts to minimize such errors. I want to have the Recent Apps and Back buttons at the bottom of my screen. Can I do that? You already have the hardware buttons at the bottom of the phone. i minimized it but now the handle is gone, how do i get it back? I still can’t locate the menu button. I have 3 choices when I press the more options button on the side panel. Wallpapers, Widgets and HMe screen settings. I still can’t get to the menu to turn on the spell check. Very frustrating. Please help. Not sure what you are talking about. The 3 dots are usually referred as menu button. if some old apps require hardware menu button, try this guide. Side key panel arrow is getting in the way of screen shots, some pictures etc, solution plese!! If you don’t want to see the small arrow of side hey panel, you can disable the side key panel in quick settings. Once the side key panel is minimized, it is docked on the side of the screen (depending on its location before minimizing). You can see the white handle near the edge. If it is in the left side, you swipe the handle to tight. If it is in right side, swipe the handle to left side of the screen.